Venezuelan-born American designer Carolina Herrera established her fashion house in 1980. The designer's chic, exquisite fashions achieved instant success. The brand launched its first fragrance, the eponymous Carolina Herrera for women, in 1988, and has launched a series of successful fragrances for men and women over the years. The company expanded its offering with the CH Carolina Herrera lifestyle brand in 2008, which includes accessories and home goods in addition to fashions, as well as a new series of fragrances for men and women under the CH label. The earliest edition was created in 1988 and the newest is from 2016. Carolina Herrera fragrances were made in collaboration with perfumers Carlos Benaim, Clement Gavarry, Clement Gavary, Rosendo Mateu, Alberto Morillas, Ann Gottlieb, Ann Gotlieb, Emilie (Bevierre) Coppermann, Lucas Sieuzac., Lucas Sieuzak, Lucas Sieuzac, Olivier Cresp, Carolina Adriana Herrera, Elisabeth Vidal, Jacques Cavallier, Marc Chaiant and Pierre Constantin Gueros. Classic and timeless with a contemporary twist, this 212 Men Eau de Toilette from Carolina Herrera makes the perfect addition to your collection of fragrances. Carolina Herrera lets you revel in the feeling of a carefree life when you wear this perfume and spread your charm. Born in 1939, Carolina Herrera is a native of Venezuela. She started her own ready-to-wear line in early 80 s and her designs are heralded for their classy and subtle styles. Most known for her elegant day and evening wear she too has her own fragrance, which bears her name. 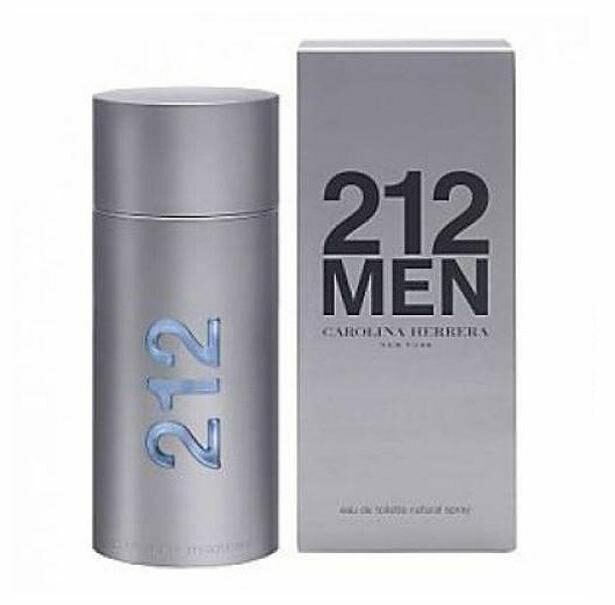 212 men by Carolina Herrera is for trendy cosmopolitan self-confident and stylish men. A fresh woods scent for the sophisticated urban man. A cosmopolitan composition of green peppercorns and sandalwood laced with fresh grapefruit and mandarin, rich gardenia and a musky incense base, 212 is confident, thick and alluring.